If art imitates life, then this one book manages to capture the very essence of life with a toddler. Heart-stopping, unpredictable, chaotic and completely absurd. One mother has transformed a common parenting anxiety into art after documenting every non-edible item that her toddler has tried to eat. 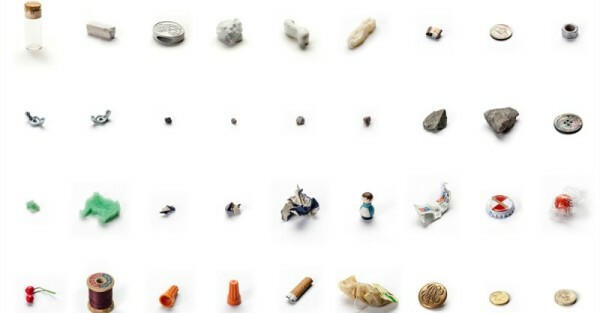 63 Objects Taken From My Son’s Mouth is exactly that – 63 objects, from pen lids to cigarette butts, that the artist’s son, Otto has tried to swallow, photographed and bound together in book form. When mother and artist, Lenka Clayton shut her eyes for two moments while in Paris, her then eight-month-old son crawled off to explore. He returned with a sachet of rat poison in his mouth, much to her fear and horror. And thus, from this one instance that every mum is all too familiar with, came the idea for Clayton’s art exhibition and book, 63 Objects Taken From My Son’s Mouth. The collection, which includes frightening objects such as bottle caps, buttons, coins and rocks, have all been taste tested by little Otto between the ages of eight and 15 months. The exhibition, which has been on display in America, is now in book form and available through Clayton’s website. It is part of her series, Residency of Motherhood, which documents life as a mother of two young children. 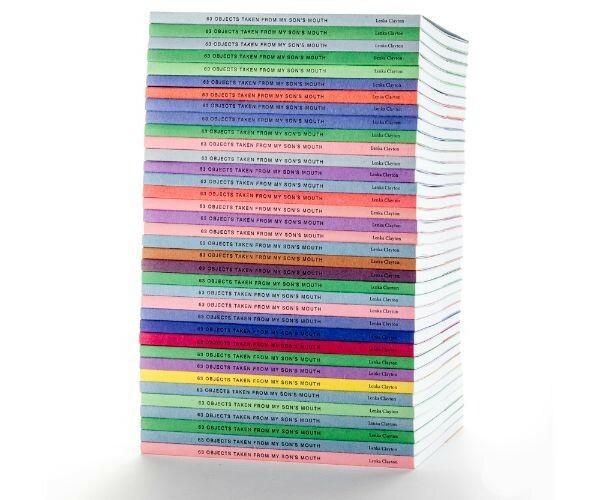 The book acts as part-baby-keepsake album and part-travel-memoir as all objects documented, from small toys to paper clips, were plucked from surfaces in the UK, Paris and the US as Clayton, her husband, Seth and Otto travelled the world. Clayton, who also has a little girl, Early, claims she will not be repeating the project with her younger one. Once is enough. Check out Clayton’s other incredible art exhibitions in her creative series Residency of Motherhood. You might also like to revisit her other heartstopping experiment, How far is too far from your toddler, where she lets Otto wander off in different places to see how far he can go before she feels compelled to chase after him.